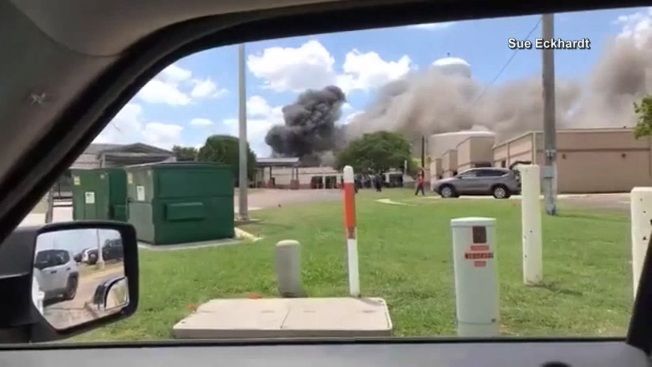 One person is dead and 15 others were hurt in a large explosion at a Central Texas hospital undergoing expansion Tuesday afternoon. The incident was reported at about 2:30 p.m. at a construction site at the Coryell Memorial Healthcare System hospital in Gatesville, 36 miles west of Waco. The office of emergency management confirmed part of the building being renovated and expanded collapsed during the explosion, according to NBC affiliate KCEN. Officials confirmed the man killed and 15 injured were employees of a subcontractor and that no patients or hospital staff were hurt. On Wednesday, officials confirmed the identity of the man killed as 44-year-old Michael Bruggman, of Rogers, south of Temple in Bell County. Some of the injured workers were burned and were flown to Parkland Memorial Hospital in Dallas; three of them are said to be in critical condition. AFD is sending 3 trucks, 1 battalion chief and 10 structural collapse Techs to assist in Gatesville TX in response to a State request to assist with a explosion with structural collapse. In a statement Wednesday, Adolfson & Peterson Construction they were the general contractor for the hospital's expansion and that the injured workers were employed by a subcontractor, Lochridge-Priest, working near the central utility plant where the explosion occurred. "Our team is deeply saddened by this tragedy and we are working closely with our partners at Coryell Memorial and Lochridge-Priest to provide support during this time. Our sincere condolences, thoughts and prayers are with the families and friends of those injured and lost," said Corbett Nichter, with Adolfson & Peterson Construction. A spokesman for the Texas-New Mexico Power Company said the explosion knocked out power for a large portion of the city. Patients were being evacuated from the hospital and from two nearby nursing homes. On Wednesday, officials said the Texas State Fire Marshal's Office has been asked to lead the investigation into the incident.